The morning of Monday, August 21, 2017, a total eclipse of the sun will occur and is expected to have a dramatic impact on the electric grid in the U.S. The path of totality will extend from South Carolina on the East Coast to Oregon on the West Coast. California's San Juaquin and Coachella valleys, both key solar producing regions, will see coverage of around 76% and 62%, respectively. And, although it will be spared the full impact, California is planning for the potential of major disruptions in its grid as the production of electricity from photovoltaic installations falls from a normal level of over 8,700MW to 5,600MW while demand is rising by 1,300MW primarily due to the increased use of electric lights. Worse-case estimates by the California Independent System Operator (CAISO) predict as much as a 4,200MW reduction in solar generation. Regardless of the actual decrease, the rate of change will be significantly higher than the system was designed to handle and will be a particularly difficult-to-manage problem. The typical ramp rate for the grid at sunrise and sunset is about 29MW per minute. The ramp rate during the eclipse is forecast to be 70MW per minute during the drop off and nearly 100MW per minute during the ending phase of the eclipse. The rapid return of PV electricity at the end of the eclipse (3X the rate the grid is designed to handle under typical conditions) is expected to be particularly difficult for the grid to absorb without going into an overload condition. As a result, CAISO is working to coordinate a “ramp up plan” that will place limits on how quickly PV power can be ramped up from the peak of the eclipse at about 10:22 a.m. until the end of the eclipse at 11:56 a.m., possibly extending into early afternoon. Behind-the-meter solar generation will be particularly hard to control and hence its impact will be difficult to estimate. Currently CAISO is obtaining behind the meter solar generation forecasts as well as large scale solar generation forecasts from two forecast service providers. The providers will be producing a forecast accounting for the solar eclipse that will automatically feed through the ISOs daily processes. The aggregate forecast for large scale solar will be available to the market participants, as well as public, through the OASIS applications. Reserves procurement: Due to the predicted movement of the transmission connected solar resources CAISO plans to commit an increased amount regulation up and regulation down to assist with the increased ramp rate of the resources. The available regulation resources will be increased to 400MW from the normal level of 250MW. Hydro Generation Usage: Due to the above average hydro year this water season it is expected that come August California will still have availability for hydro to carry regulation and/or energy during the eclipse. 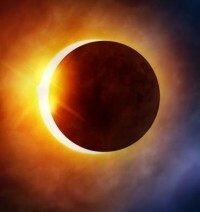 CAISO will be working with the hydro community and inform participants of the additional need for flexibility on August 21st due to the eclipse to assist with that flexibility being available to the market optimization. EIM (Energy Imbalance Market) Transfers: The EIM provides a mechanism to share and diversify resources to assist in more enhanced management of the solar eclipse moving across the Western United States. Due to the forecasts for behind the meter and large scale renewable resources being in the market optimization, the EIM transfers will be optimized through the market dispatch. It will be important that all EIM participants account for the solar eclipse effects on their solar renewable resource forecasts in their base schedules that are being submitted by their forecast service providers as well. The Pacificorp EMI is owned by Warren Buffett’s Berkshire Hathaway Energy. Pacific Power (PACW), its western arm, serves electricity customers in Oregon, Washington, Idaho, Wyoming, Montana, and California. Rocky Mountain Power (PACE), its eastern arm, serves Utah, Idaho, and Wyoming. Nevada and Arizona operate independently as participants in the Western states EMI. Gas Coordination: CAISO will coordinate with Southern California gas and thermal generators to ensure they have procured enough gas to handle generation deviations during the day of the solar eclipse. Outage Coordination: CAISO will be analyzing the impacts of scheduled generator and transmission outages prior to approving for August 21st. Future events like the August eclipse have the potential to be even more disastrous. Today, California uses about half of U.S. solar capacity and about 10 percent of the state’s electricity is from PV; enough to power Los Angeles. A new estimate from the U.S. government shows that California met its goal to produce about half the state's electricity from renewable sources for three hours on March 11. The estimate comes from the U.S. Department of Energy's statistics division. The U.S. Department of Energy's statistics division used data from the CAISO, which manages the electricity grid across 80 percent of California and part of Nevada. The record was set when almost 40 percent of the electricity flowing across the grid came from large-scale solar power plants. Factor in electricity produced by area homes and businesses, and solar met about half the overall electricity demand in the middle of the day. California aims to have 50 percent of all electricity come from renewable sources by 2030.